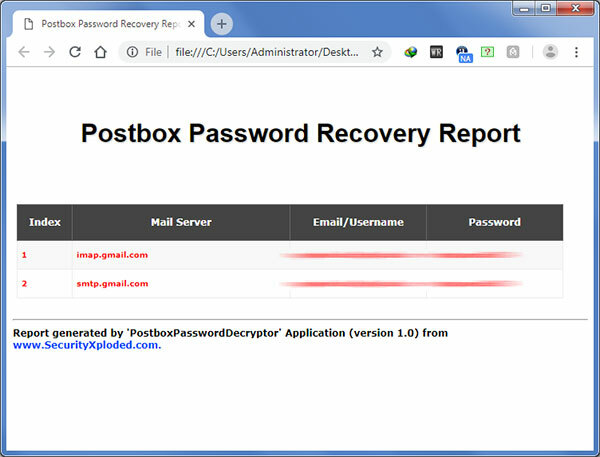 Postbox Password Decryptor is the FREE software to instantly recover your lost or forgotten mail passwords from Postbox - one of the popular email client. Postbox is a free email client which stores the mail account passwords on the local database for subsequent logins so that user don't have to type the password everytime. 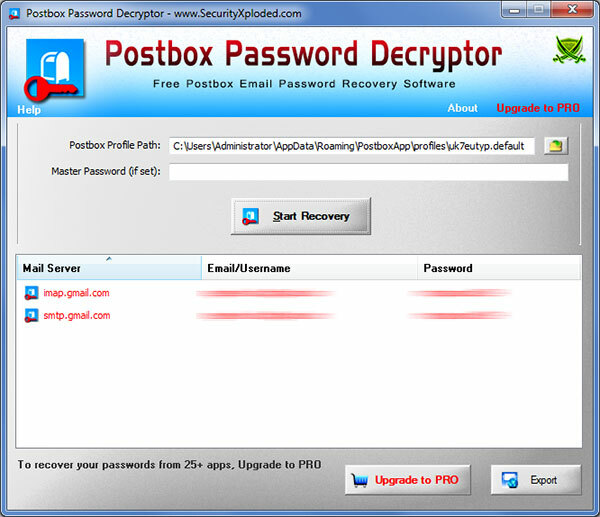 Postbox Password Decryptor helps in instantly recovering all such stored mail passwords. You can also use it to recover the Postbox account passwords from other system as well. Postbox Password Decryptor works on wide platforms starting from Windows XP to Windows 10. Supports recovery of passwords from local system as well as remote system. Postbox Password Decryptor comes with Installer so that you can install it locally on your system for regular usage. This installer has intuitive wizard which guides you through series of steps in completion of installation. Postbox Password Decryptor is the simple to use with its interactive GUI interace. On launch, Postbox Password Decryptor automatically populates the Postbox's default profile location. If you have set the master password for your Postbox, then you need to enter the same in the 'master password box'. Once the profile location is specified, you can click on 'Start Recovery' button and Postbox Password Decryptor will instantly recover all passwords from 'Postbox Password Store'. You can also use Postbox Password Decryptor to recover passwords from different system either Windows or Linux. In such case you can copy Postbox profile data from remote system to local machine and then specify that path in the profile location field for recovering such passwords. First public release of Postbox Password Decryptor.